Do you love looking at classic American made cars? This book is full of Cadillacs from a few decades. It includes a before and after restoration of a 1959 Cadillac! 1959 Cadillac Sedan Deville with pictures of before and after restoration. 1938 Cadillac Series 90 V 16 Fleetwood Limousine once owned by W.C. Fields. 1954 Cadillac Fleetwood that was used by Marilyn Monroe and Bing Crosby. Vinny O’Hare is a photographer with an eye for classic cars and nature photography. 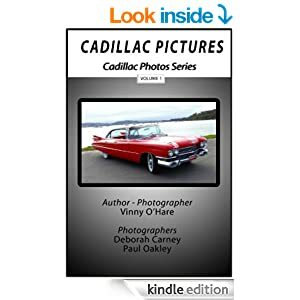 Combining a love of photography with classic cars this book has many beautiful pictures of Cadillacs from a few era’s. Vinny’s work has been featured on websites like CNN and published in more than a few photography publications.